For the potato salad: Chop up the potato into small squares and place into boiling water, cover and boil for about 20 minutes or until soft (but not too soft or you will end up with mashed potato instead). Once they have softened, drain the water and place them in some cold water to stop the cooking process, then drain once again and place them onto some kitchen roll so any excess water gets soaked up. Place the potatoes in a bowl and add the Mayola, rosemary and salt & pepper, then mix together. Whilst the potatoes boil, chop the ends off the broccoli and any straggly bits and boil until aldente or cooked through (depending on how you like it). 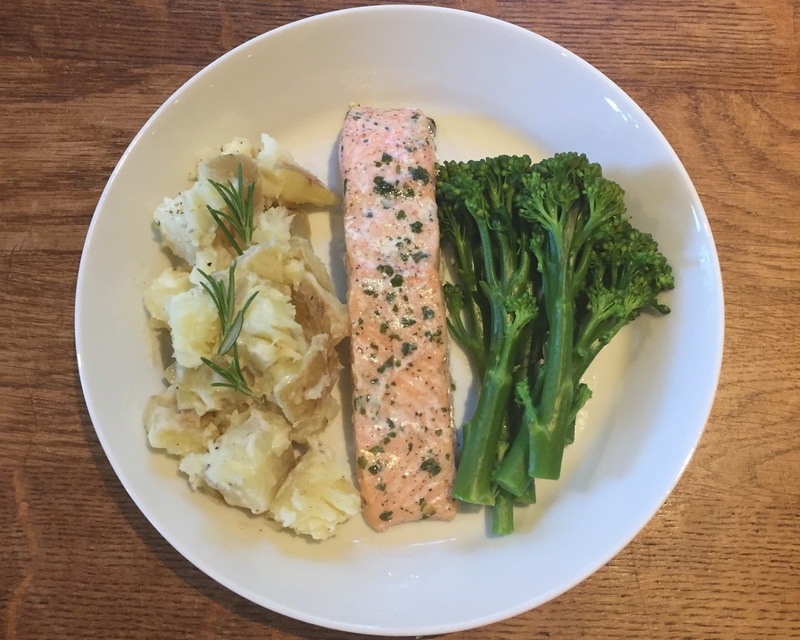 The salmon in this case is bought from Marks & Spencer - however gently pan frying a salmon fillet would take minutes or simply bake in the oven with some fresh lemon and herbs in some tinfoil to seal in all the juices and moisture.